I often find myself suggesting to brides to gain some ideas and inspiration by browsing the internet and wedding blogs for what they would like for their special day to look and feel like. One of my all-time favorites to visit is Style Me Pretty. Their site seems to never fail at inspiring with some phenomenal wedding ideas and photographs. This weekend they are featuring a wedding at the amazing Moon Dance Villas. Moon Dance Villas may just be the finest rental accommodations in all of Negril, Jamaica. It is located on the famous 7 mile-beach in Negril and offers six world-class beach front homes that are sufficient with privacy, elegance, comfort, pleasure and remarkable service. Each villa is fully staffed and equipped to satisfy every need and comfort: chef, bartender,housekeeper, concierge service, 24-hour security, private beach front, water sports and beach activities, pool, Jacuzzi, TV, VCR, computer with Internet access, fax, direct telephone, indoor/outdoor stereos, and airport transfer from Montego Bay – all included. Be sure and check out more of this fantabulous wedding HERE. Va Va Voom! It’s the Grand Velas! Hola wedding world! 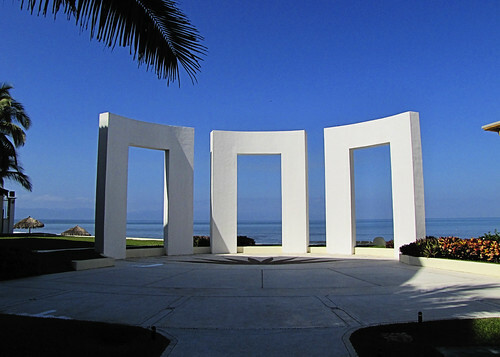 Nicki and I have recently returned from the beautiful Puerto Vallarta! We were able to meet some wonderful people, eat gourmet food, inspect some amazing resorts and we had some adventure thrown in there too. The first resort that we would like to share with you is the ever-so-fabulous Grand Velas. Their wedding packages along with their wedding team goes over and beyond to satisfy even the pickiest of brides. 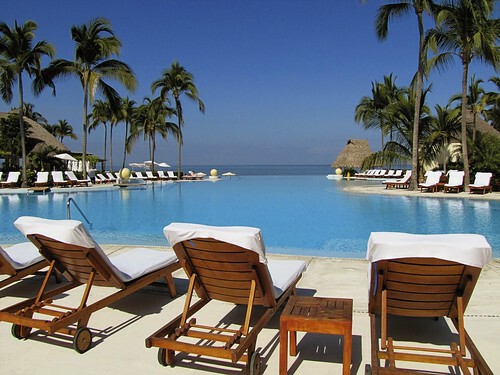 The Grand Velas All Suites and Spa Resort in Nuevo Vallarta has been a hotel that I’ve been dying to see since I started in the travel industry in 2005. As you can imagine, I was giddy as a little school girl when we were taking in all of it’s beauty when Nicki and I recently had the chance to visit there. It was even more beautiful than I had imagined. As soon as you walk up, you enter into a spacious and beautiful open-air lobby with spectacular views of the Pacific ocean. You immediately notice that there has been careful consideration into every inch of detail throughout the resort. They greet you with a smile, cold towel with a sinus-clearing scent and a champagne glass filled with the daily specialty drink. 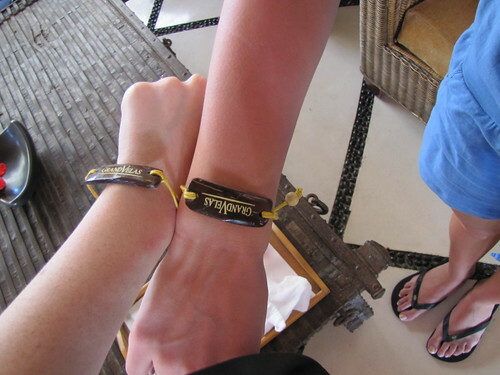 Instead of tacky, plastic wristbands you will get to wear a cute, keepsake bracelet. The pools were just as impressive. The infinity pools appeared to flow gracefully right into pacific ocean. A trick to the eye that made me do a double take. The lounge chairs are beautifully designed with beach towels carefully rolled up on each one. The pool side service was friendly and prompt. Next, we walked down to the beach which made us stop for a few moments. In those moments we simply tried to take it all in. Something about the sound of the waves coming in surrounded by impeccable design and service just made it all come together. I then realized why this resort had won so many awards. As we were walking up to check out their rooms, we couldn’t help but to notice a structure that stole the spotlight. It was obvious that this is where they hold some magnificent weddings and gatherings. 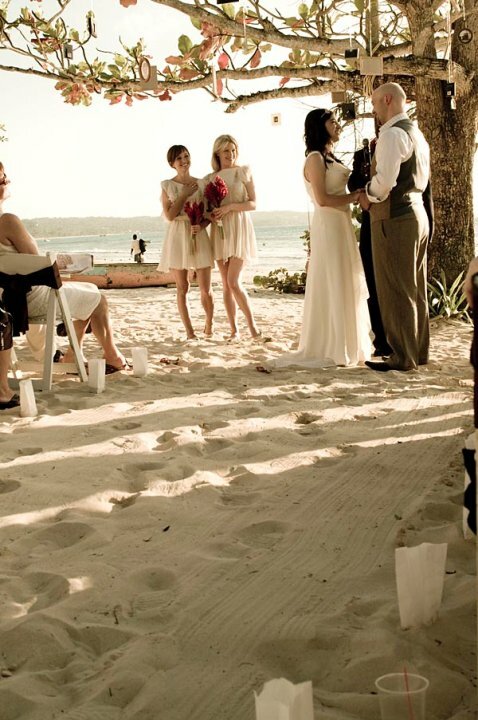 Even if you had the ceremony on the beach, wouldn’t this be a perfect reception spot?? With the ocean in the background? We will go over the weddings a little bit later. Now on to the rooms! Every single suite was decorated in neutral tones that had pops of tropical-influenced color here and there. 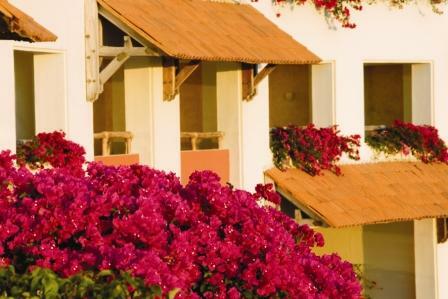 The most memorable part for me was that every suite had private, oceanfront balconies decorated with bold, beautiful flowers in the shades of fuchsia. As we walked through to each restaurant we kept pointing out gorgeous details that would catch our eye such as Koi Fish Ponds and the spacious, lush hallways. The resort has 4 Signature Restaurants that each have their own unique style and music. Lucca, the Italian has a piano player while Piaf, the French restaurant has a violin player. Please note that Piaf’s is for 12 years old and older only. Next up, that award-winning spa! As soon as you walk in you smell the aroma and your stress can’t help but to melt away. Haha! Corny I know but oh, so true. The Grand Velas is a member of the Leading Spas of the World and they offer every treatment imaginable. The even offer daily meditation, yoga, and Pilates classes. AAA, Conde Nast Traveler, Leading Hotels of the World and more, have honored Grand Velas Resorts for its all-inclusive luxury, superior service, spa facilities, amazing gourmet dining, and state-of-the-art resort facilities. The Grand Velas definitely did not disappoint and we can not wait to visit again. Hello wedding world! Today I am excited to have a special guest from the beautiful beaches of Mexico – Rafaela Lantigua. Rafaela is the Wedding Department Manager for Lomas Travel and for all of the Karisma weddings. She is THE beach wedding guru and a wonderful asset to the Weddings by Legacy Travel team. 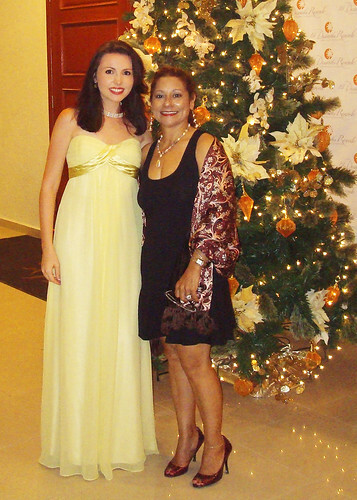 Rafaela and me at the GIVC ceremony at the El Dorado Royale. Hello Rafaela and thank you for taking time out of your busy schedule to be with us today! So how long have you been helping plan dream weddings for the Karisma resorts? SEEING THE FACE OF THE BRIDE AS SHE WALKS TOWARDS HER FUTURE HUSBAND AND HER NEW LIFE. What are some of the most fun/memorable weddings you’ve planned? WELL TERRAH, THERE HAS BEEN SO MANY…AS EACH ONE HAS ITS OWN SPECIAL TOUCH…KEEPING IN MIND THAT OUR JOB IS TO MAKE THEIR DREAM A REALITY. THERE WAS A WEDDING TOWARDS THE END OF THE YEAR THAT WAS UNIQUE. THE BRIDE WAS OF MEXICAN DECENT AND WANTED HER WEDDING TO FALL ON THE DAY OF THE DEAD. 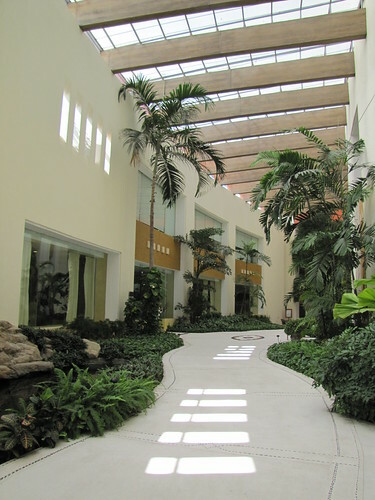 IT WAS HELD AT THE BEAUTIFUL EL DORADO MAROMA. SHE REQUESTED THAT THE CHURCH AND RECEPTION WAS ALL IN THE DAY OF THE DEAD THEME. THE COLORS, THE DECORATIONS, EVERYTHING WAS JUST BEAUTIFUL! THE ORANGE COLORS AND SKULLS MADE IT VERY AUTHENTIC MEXICAN. EVEN THE CAKE WAS A SKULL! IT WAS VERY IMPRESSIVE, UNIQUE AND BEAUTIFUL. How do you feel about wedding favors? Have there been any impressive or creative ones that made you stop and admire? I LOVE WEDDING FAVORS!!! ESPECIALLY THE ONES THAT THE BRIDE OR HER FAMILY HAD HANDCRAFTED…THOSE ARE ALWAYS SPECIAL….THE ONES THAT IMPRESS ME THE MOST ARE THE ONES THAT ARE HANDMADE OR OUT OF RECYCLED MATERIAL, BEACH BAGS, NOTEBOOKS WITH DRY FLOWERS TO MENTION A FEW. DEFINITELY VOTIVES AND CANDLES ON THE BEACH…DUE TO THE WIND AND COST. Is there anything new and exciting going on with Karisma weddings? WE ALWAYS HAVE SOMETHING NEW AND INNOVATIVE GOING ON AT OUR HOTELS…FROM THE BRAND NEW SPA AT EL DORADO ROYALE CASITAS, A NEW SWING BAR AT AZUL SENSATORI, A PRIVATE GARDEN LOCATION AT EL DORADO SEASIDE SUITES…AND MORE! JUST ASK US AT TIME OF BOOKING. PLAN EARLY SO YOU CAN HAVE OPTIONS ON CEREMONY TIMES AND LOCATIONS. I recently returned from a trip where I visited the beautiful Riviera Maya of Mexico. The Riviera Maya is definitely one of my most favorite destinations to travel to. A couple of reasons why: the white powdery sand, blue waters, friendly people, history and endless activities to try. Each of these 5 star all-inclusive resorts are completely gorgeous and unique in their own ways. If the Riviera Maya interests you, give us a call so we can help you decide which would be perfect for you and your guests.